When I decided to buy a 225mm engineer's square, there was only one manufacturer I wanted to investigate. The result was a Moore & Wright No.400 square, made to BS 893 and DIN 875 - the highest level of accuracy available without choosing a toolroom calibration instrument. The finish on every edge is exemplary, confirming that although a more expensive option, this is a superior item. The M & W square looks perfect in every detail. The photograph also shows a 110mm M & W square, probably 60 years old and the only difference is the name being stamped into the stock. The blade and stock surfaces are both parallel within the limits of my engineering standard measurement. The blade length is 237mm from the stock to the end; its width is 36mm and thickness 3mm. The stock is 140mm long, 36mm wide and 18mm thick, weighing around 900 grams. In use, the Moore & Wright square is a heavyweight, which reduces the chance of accidental movement occurring. The thickness of the blade requires greater care to ensure knife cuts are correctly placed. Standing with the blade vertical makes the weight stable and easy to use. One slight downside is the excellent machining means the corners are precise and pose a risk of easily marking finished timber surfaces. 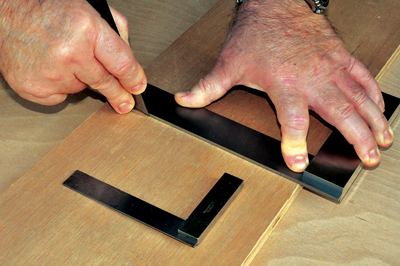 The photo in the gallery shows how to hold a large square securely with the thumb pressing down on the back edge of the blade and also onto the workpiece. The index finger presses the blade down firmly and other fingers pull the stock firmly onto the workpiece's edge.